Originally written for The Vista. As soon as I arrived at Manvar, the pace slowed from the chaos of the blue city we had left behind. Turning off the main road, onto a dusty dirt track towards our tented abode, I couldn’t help but marvel at the expanse of rugged desert terrain. The landscape is vast yet intimate, sand dunes hug the flowering desert shrubs; spice plantations breakthrough the golden soil. The air is fresh with a lingering scent of cumin. Canvas tents blend with the subtle colours of its surroundings. Exploring the land embracing us, we slide down vertical dunes, weave through remote clusters of painted Rajasthan mud huts. We pass children climbing trees, eager to shout a happy hello. Indifferent to the passing jeeps the herds of goats continue to graze on the solitary patches of green, cows sleep in the easy slow midday sun. We spot many Indian chinkara gazelle throughout our journey, in awe of their elegance I tried many times to reach for my camera fast enough to take a photo before they leapt into the horizon. Deep into the desert we come across a small village. 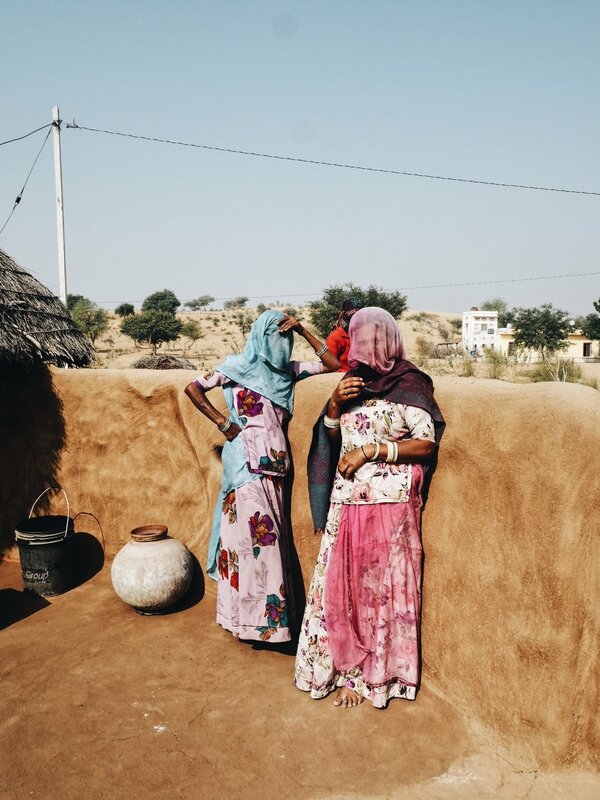 Here in remote Rajasthan most live in a Bhunga, a mud mixed house made with straw and cow dung. 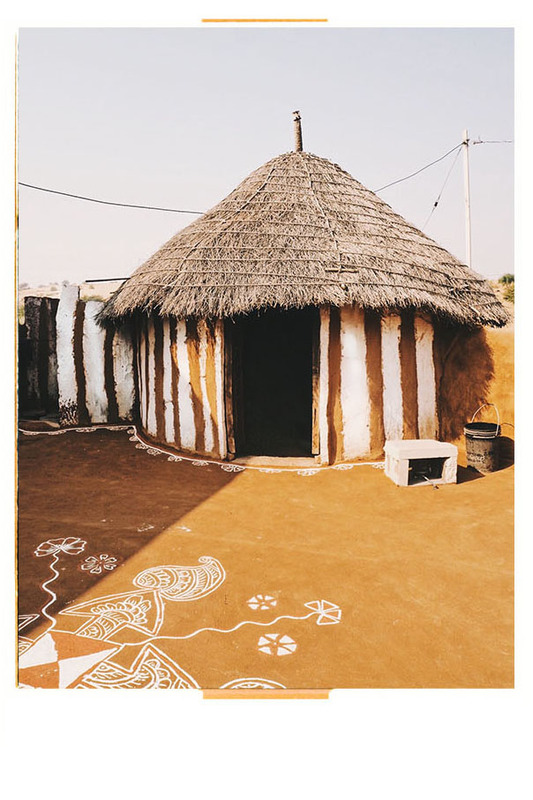 The ochre washed abodes are naturally insulated, adapting to their climate to stay cool in summers and warm in winters. The women take pride in their homes, painting the exterior walls and adorning the interiors with traditional patterns. Generations of these families have lived in this part of India in the same way since ancient times. There’s no electricity or running water here but the few who do occupy its barren landscape have learned to cope with these conditions. Food is stored in cool chambers for up to a year, the men go off to work making money from agriculture, weaving and as musicians. It’s humbling to see daily life here. I see a group gathered around in deep conversation with one another, no distraction of a computer or television to take their attention away. A mother cradles her child into her arms, she paints kohl under her eyes to protect from the blaring sun above. The older children climb trees and build castles with the desert sand, ringing their bells to herd the goats. We felt so welcome, the women were excited to invite us in to their homes and show us their daily way of life. It was heartwarming and reminds me that it’s the simple things. Life is short and the people, places and moments are what matter most. As dusk sets in, the temperature gently drops, sand cools underfoot. We ride camels out into the desert to watch the final light fade there is only distant sounds from the small farms of children herding the goats home, a perfect crescent moon peeks above and it's time to ride back our candle lit camp. After just two nights we easily slipped into a routine of afternoons lazing in hammocks and cold nights wrapped in blankets by the camp fire transported to another world by the local musicians & dancers. 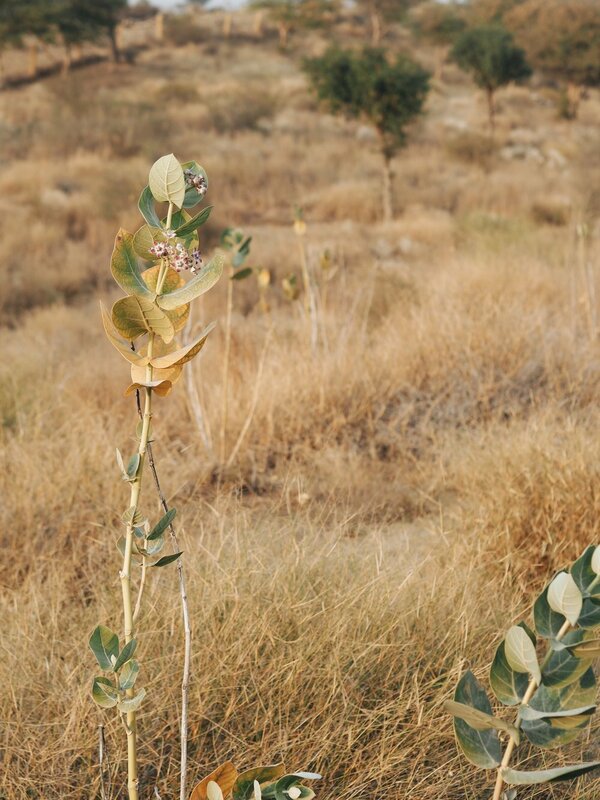 In a world where it’s ever becoming harder to discover the untouched, the Thar desert is a place of genuine, raw beauty where time stands still.